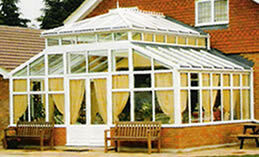 Here at AKH Installations we believe that a conservatory is an extension to your home, to be enjoyed all year round. We also feel that each trade is a specialist in his own area. That is why your base and brickwork will be installed by qualified, registered builders. Your frames and roof will be installed by Fensa Registered Installers, and any electrics will be wired by a fully qualified electrician. You will be assigned your own consultant who will guide you through the process from start to finish ensuring that you get everything that you want from your conservatory. From the design, to the finishing touches everything that you could possibly need, will be catered for. We are so proud of our products that we will provide a full 10 year guarantee including service engineer callouts. Please give us a call today on 01702 257276 for your FREE no obligation quotation. AKH Installations specialise in upvc double glazing, replacement windows, doors, conservatories, in Essex, UK. AKH Installations supplies and installs upvc double glazing, replacement windows, doors, and conservatories for trade and commercial. AKH Installations offer free quotations for replacement windows and window repairs.